#616 Haystack Connections Magazine Spring 2018 is Now Available ! 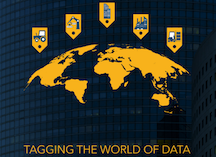 With over 45 pages of content from members around the world the theme of this issue is Tagging the World of Data which addresses not only the growing global adoption of Haystack, but also the extension of Haystack into applications beyond buildings system. From day 1 Haystack was designed for any type of smart device data and application. We want to thank all of the sponsors that have contributed to this issue of the magazine - with your support we have been able to significantly "up our game". Finally, special thanks to everyone that contributed to the content for this issue of the magazine and special thanks to Therese Sullivan, Editor, and Robin Bestel for their tremendous work producing this issue -- its our best yet!